Is your productivity hampered by having to manually coordinate and organize all your team's efforts across different platforms? Improve your workflow and cut hours of busy work and maintenance with recurring tasks and task automation. ActiveCollab gives you the option to create recurring tasks for activities that need to repeat at specific intervals. These repeating activities usually constitute a core part of your routine - weekly reports, performance reviews, staff meetings, etc. Recurring tasks are, in essence, task templates that are created automatically on a given time - daily, weekly, monthly, etc. Of course, some of the tasks will come up every now and again in exactly the same form, but not in regular intervals. 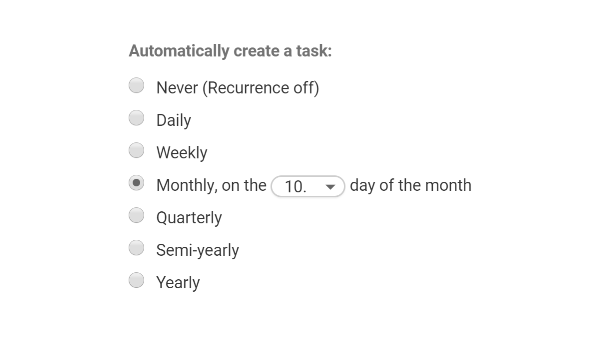 For situations like that, you can use these task templates without adding the date trigger. This new set of tools and options should improve many aspects of your planning and productivity. This, in turn, should give you more breathing space to focus on the more important aspects of your Real Work.